JAKARTA -- South Korea's star fencers will chase gold medals in team events at the 18th Asian Games this week after they failed to win individual titles. Park Sang-young and Kim Ji-yeon will compete in team events Wednesday, hoping to make up for their loss in individual events Sunday. 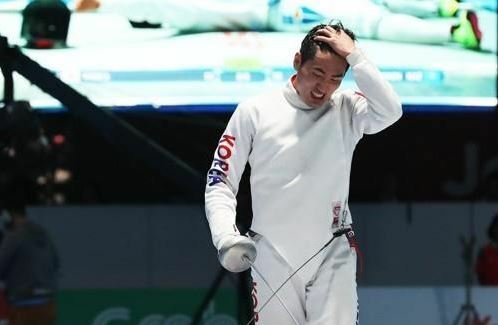 Park, a gold medalist at the 2016 Rio de Janeiro Olympics, took a silver medal in the men's individual epee after losing to Dmitriy Alexanin of Kazakhstan. Kim, a 2012 London Olympics gold medalist, won a bronze medal in the women's individual sabre. Park will team up with Kweon Young-jun, Park Kyoung-doo and Jung Jin-sun, who bagged bronze in the men's individual epee, to defend their Asian Games title. South Korea has won the men's team epee gold in the last three Asian Games. Kim will compete in the women's sabre team competition with Yoon Ji-su, Choi Soo-yeon and Hwang Seon-a. South Korea is also the defending champion in the women's team sabre. Kim, Yoon and Hwang were the members of the women's sabre team that topped the 2014 Incheon Asian Games. Elsewhere, Greco-Roman wrestler Kim Hyeon-woo will start his Asian Games title defense. Kim is considered the favorite to win the men's 77kg division. Before taking the gold at the 2014 Asian Games, he also won the 2012 London Olympics. The 29-year-old won bronze at the 2016 Rio de Janeiro Olympics. In weightlifting, Won Jeong-sik is set to compete for gold. The 27-year-old is the gold medalist in the men's 69kg division at the 2017 World Championships. He may compete for the top podium finish with North Korea's Kim Myong-hyok and O Kang-chol. South Korea can also expect a gold medal in swimming as An Se-hyeon will compete in her main event, the 200m butterfly at the Aquatic Center at Gelora Bung Karno Sports Complex in Jakarta. She finished fourth in the 200m butterfly at the world championships last year. South Korean taekwondo practitioners Cho Gang-min and Lee Hwa-joon are eyeing podium finishes in the men's 63kg and 80kg, respectively.